New pill may replace hair dye in preventing and reversing gray hair. 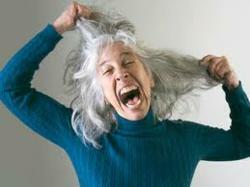 Most of people don't like having gray hair and in fact, they spend a lot of time trying to get rid of it. Going gray can be a real blow to a person’s self-confidence and for some it’s a constant reminder of growing older. Women and men routinely spend a fortune on coloring those grays, but now, there's a pill you can take to get rid of gray hair…permanently. Beth Skelly of Ft. Lauderdale, Florida was going gray and tried all kinds of things to hide it. "I started off plucking the grays and then I said I'm losing this battle and so then I started dying my hair," Skelly said. Elizabeth Skelly is a fan of "Go Away Gray." She's been taking 2 pills a day for about six weeks and now her gray hair is gone! "I'd go to the mirror, I'd look, and I'd say, "Wow the grays are NOT coming in. Color is coming back," said Elizabeth. "Seeing is believing. When people see me they say, 'you're 53?'" "It's absolutely 100 percent safe," said Cathy Beggan, President of Rise-N-Shine, LLC and founder of "Go Away Gray." Beggan said the secret ingredient is an enzyme called Catalase that counteracts our body's natural production of hydrogen peroxide. "Our bodies produce hydrogen peroxide which bleaches our hair from the inside out. Our bodies also produce an enzyme called Catalase which breaks down the hydrogen peroxide. When we don't produce enough Catalase, the hydrogen peroxide cannot be broken down. As a result, hair is bleached from the inside out, turning it gray," Beggan said. Go Away Gray puts the Catalase back in your body, so it can break down the peroxide. This stops the graying process and it allows your natural hair color to come back at the root. It's working for Skelly and countless other happy customers, who are amazed at how a bottle of pills, not a bottle of hair color, got rid of their gray. A one-month supply of "Go Away Gray" costs $29.99 and can be found in select stores and online at http://www.goawaygray.com. More than 5,000 different chemicals are used in various hair dye formulas to achieve the desired hair shade or color. Hair dyes contain chemicals that are usually amino compounds, lead, and ammonia. Although safer today than 20 years ago, hair dyes still contain potentially skin-irritating chemicals used to help the color penetrate the hair. Toxic chemicals from dyes are being rinsed from colorist’s sinks everyday into the waterways and affecting fish and groundwater supplies, creating potential environmental risks. Although hair coloring offers instant results, the results are only temporary. It can take up to 8 weeks to start seeing the results of Go Away Gray, but they are permanent. Go Away Gray pills offer long-lasting results in bringing back natural hair color while promoting fuller and thicker hair. Rise-N-Shine, LLC was founded in 2006 by Cathy Beggan. A minority/woman owned business, Rise-N-Shine is continuously bringing groundbreaking products to the nutritional marketplace and was founded on the foreground of providing natural solutions to everyday problems. Our products are manufactured for safety in the United States of America in a world class, fully climate-controlled, 150,000 square foot FDA-inspected facility that ensures purity and accuracy of materials through inspection and evaluation at every step of production and packaging.